Added: United Kingdom, Finnish, Hebrew, German (Mac), Italian, Swiss (DE & FR) keyboard layouts - it turns out that for some languages, Mac computers use slightly different keyboard layout. Note about Hebrew and Swiss (DE) layouts: SGCap mechanism is not yet supported, some characters won't be available. Added "function" ("Fn") keys screen - can be accessed from both custom and system keyboard screens. Fixed performance issue (custom keyboard) - due to a bug, screen was refreshed 20 times a second, instead of only when necessary. This caused performance problems on slower devices. 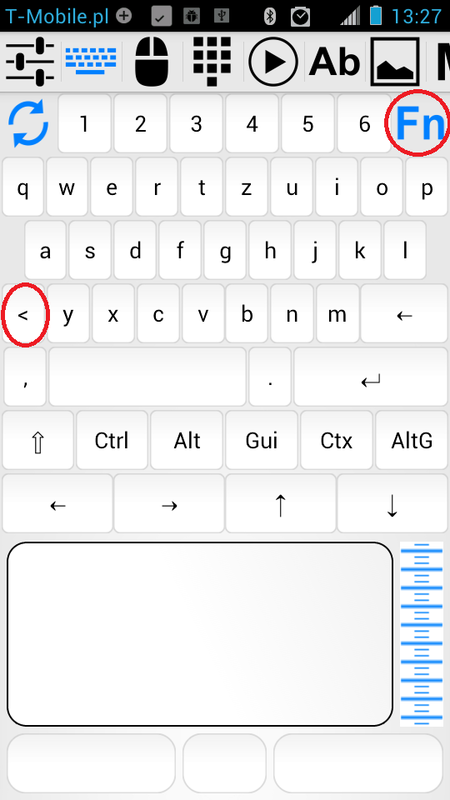 Added non-US backslash key (custom keyboard, depends on selected layout) - this key will only appear when it is present in currently selected keyboard layout. Fixed special characters problem for some non-US layouts (system keyboard) - sometimes US layout was used instead of currently selected layout. Additional key "non-US backslash" will now appear in some keyboard layouts (like German). 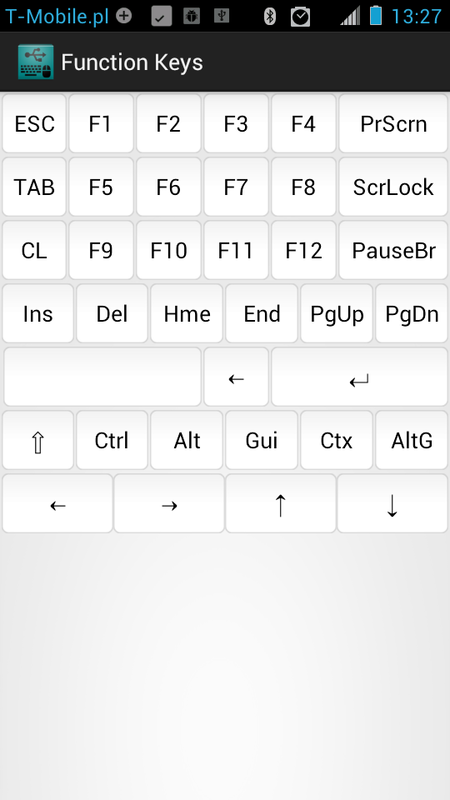 Use "Fn" button to access function keys activity. Added: French, Spanish, Norwegian and Swedish keyboard layouts - this is a result of using latest version of InputStickAPI. At the same time it solved some other problems (more info here). Mousepad can be displayed when system keyboard is used - you must adjust its height manually, depending on your screen resolution and how much space is occupied by your virtual keyboard (make sure that mouse buttons are not covered by the keyboard). 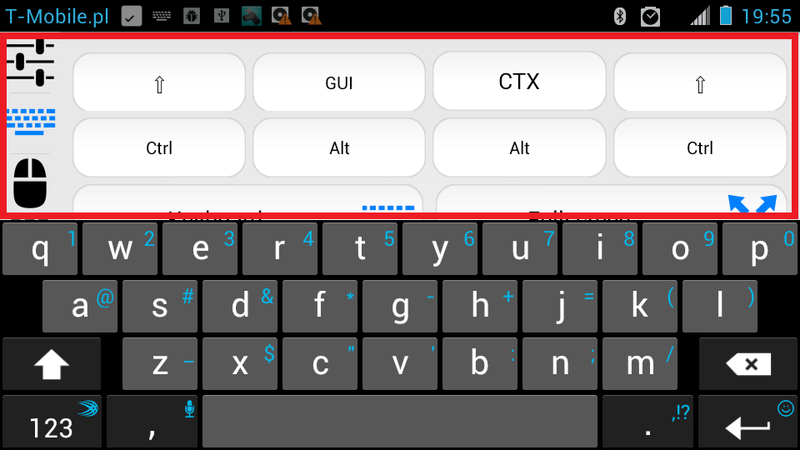 Note: some virtual keyboards can block access to other UI elements when in landscape mode. Looks like nothing can be done about this problem. System keyboard with mousepad enabled. 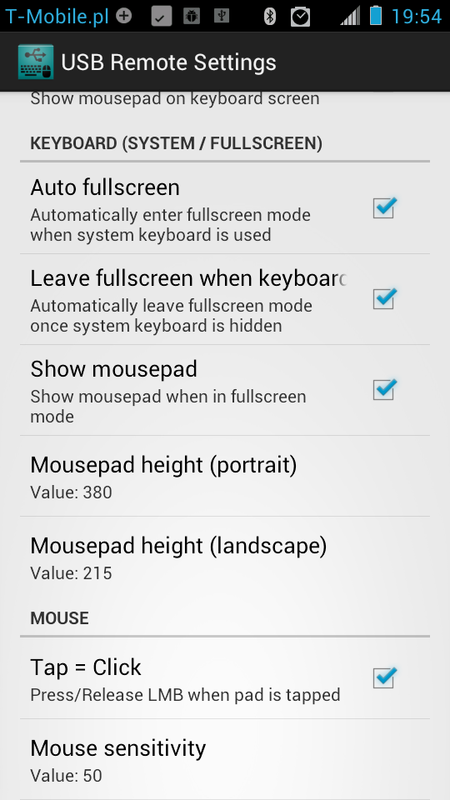 New settings for system keyboard. UI elements inside red outline are blocked by the virtual keyboard! Auto fullscreen and auto leave fullscreen options - these options will make it a bit easier and faster to use system keyboard in fullscreen mode. If you use system keyboard option (instead of custom keyboard) you should definitely give it a try. Tips messages - brief tips messages will be displayed in various places. Each message will be displayed only once. 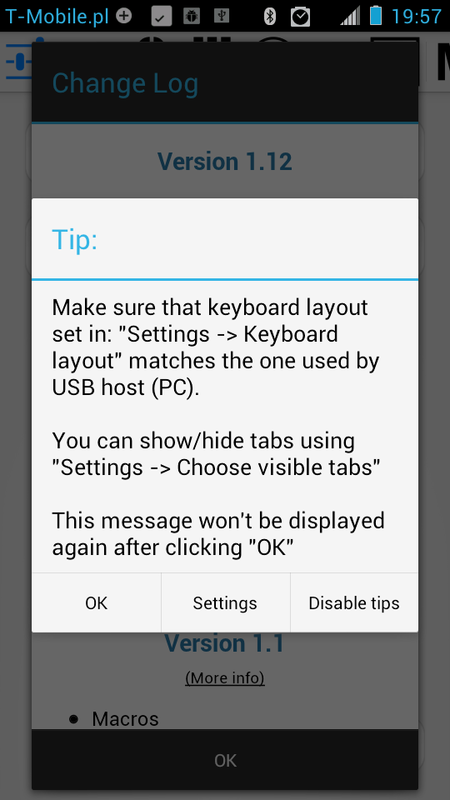 There is also a button which will immediately disable all tips messages. Added info dialog about required hardware - looks like a lot of people expect this app to work over USB cable, without even reading two sentences of app description. Well, I guess that the name can be misleading after all, so I hope that the new info dialog will help at least a bit. This message will be displayed only once. Minor UI modifications - new toggle buttons, "inputstick.com" button, some changes in Settings screen (keyboard options are now spitted between custom and system keyboard).